We’re just back from the GANZ (Gestalt Australia and New Zealand) conference in Canberra where we gave a presentation on our eclectic approach to couples therapy, and on the co-therapy model we practice and talk about on this site. It was gratifying to receive such positive feedback on our way of working, and a great opportunity for us to reflect on how we work and what it is that makes co-therapy so effective. Not to be underestimated is the years of work we’ve done to achieve a quiet and grounded sense of happiness and security in our own relationship, and to see that something of that can “rub off” on the couples we work with. In intimate relationships, so much of the interactions are rooted in out-of-awareness states, and this can work for couples in a positive way, grounding them in a real sense of couple security; as well as in a negative way when these interactions trigger disruptive patterns and cause suffering. So here’s some background from the slide on “the cogwheels”, one that a member of the audience asked us to write more about. It’s a simplified model that we find helps couples to figure out what’s going on in tense moments. The large touching circles above represent the two partners in a couple interaction. Also shown is the cerebral cortex and the amygdala in each – the so-called two brains. Lastly what’s shown in the diagram is the sensory thalamus: this processes incoming sensory data and decides whether there’s a threat involved. 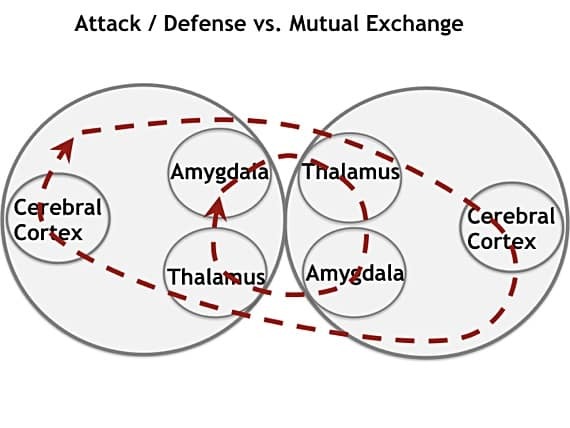 If one partner experiences some kind of threat or danger in the interaction, the sensory thalamus can be quick to reroute nerve impulses to the amygdala. We say this person is “triggered”, and their behaviour is then usually a fast and reactive combination that is primarily defensive. We say that one partner has taken the path of the “small cog wheel” (shown as the smaller dotted red line above). They’ve switched from large cog wheel to small. The person is “triggered”, and their behaviour is then usually defensive. The problem with this reaction (as well as the suffering it causes the person who’s switched) is that the reaction is quickly picked up by the other person, causing them to potentially also switch from large to small cog wheel. The situation quickly escalates and the intimate system becomes threatened (fighting). When all’s going well, the “happy path” is shown by the larger dotted red line: the large cog wheel. A couple in this dynamic is doing well and both partners are enjoying their contact and interaction. The thalamus detects no threats on either side. We can “catch” what’s happening in these couple interactions. An important part of what we do in couples therapy is to “catch” what’s happening in the couple interactions, to bring these patterns into awareness, and to support the couple to use pacing and self-support to slow these interactions; to give the neocortex time to operate and to prevent amygdala reactions from controlling the scene. The experiential approach of Gestalt is well suited for this work.